For example, Facebook’s fixed-data-table didn’t meet our needs since its main use case is handling huge amounts of data, and in most cases we just need to show a small number of rows, and allow the user to sort, paginate, and filter the data. Other libraries were not being actively maintained, or made too many decisions on how the data is displayed, or were missing filtering and pagination. So what did we do? We implemented a nice and clean, easy to use React and Redux friendly data table component and called it sematable. We needed something that is focused on working with data, not on how the data is displayed. We still provide a Table component for showing the data which is based on Bootstrap 4 and uses Font-Awesome icons, but you can also use some other table component to display the data which sematable provides. 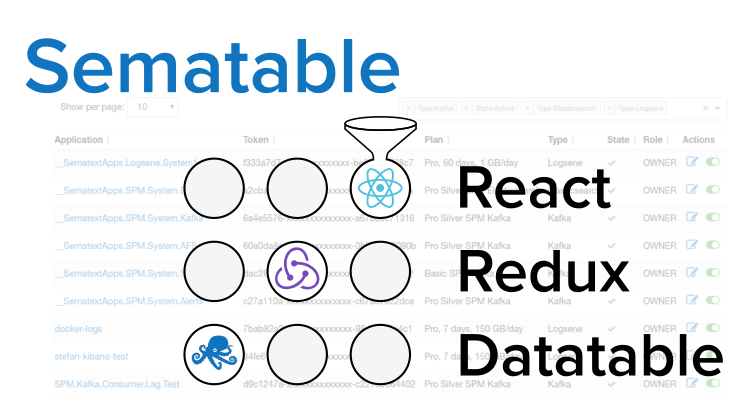 We use sematable wherever we need to show tabular client-side data, and want the user to have some common functionality such as pagination, sorting, searching, and filtering. Sematable is not the right choice if you want to show huge amounts of data on just one page since the default table component doesn’t implement windowing, or if filtering and pagination should be implemented server-side. For that we use react-virtualized for handling infinite loading and huge amounts of data, like our logs view in Logsene. If you are passionate about front-end or full-stack development, note that we’re hiring worldwide! I figured out the solution to the problem above – the sematable wrapped component must be included as a sub-component (I think). From that excerpt, it looks like the server doesn't include the row level data. Any ideas of why? Uncaught Error: React DOM tree root should always have a node reference.